BEIJING - Li Baozhong has been busy rehearsing his dance moves for a performance to be given during the May Day holiday. The 24-year-old migrant worker is a dance instructor at the Migrant Workers' Home, a cultural center established by and for migrant workers in the village of Picun in suburban Beijing. "It (the cultural center) will not start to warm up until the evening, when nearby workers finish their shifts," Li said, pointing to a renovated factory that now serves as the cultural center. Li, previously a resident of a rural area in east China's Shandong Province, worked as a waiter at a five-star hotel in south China's city of Shenzhen for eight years before moving to Beijing two weeks ago. Li now gives free dance lessons for migrant workers living in Picun, as well as works as a volunteer at the Migrant Workers' Home, which provides him with accommodations. "Beijing is not so far from Shenzhen. China's so small now," Li said. Li and several of his friends in Shenzhen formed a dance group last year that became popular after appearing on "China Dream Show," a televised talent contest. The group started out dancing in front of a factory in Shenzhen, which is known as the frontier of China's reform and opening up efforts. Before reform and opening up began in the late 1970s, about 80 percent of China's population lived in rural areas. At that time, young people in the countryside aspired to be laborers. 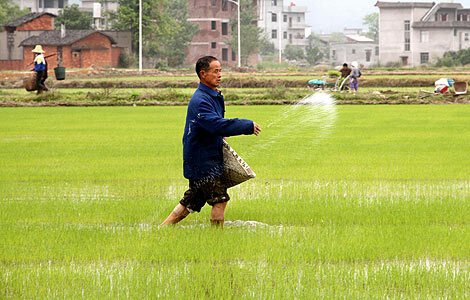 However, three decades of reform in rural China have injected vitality into local economies. With agricultural production becoming more efficient, surplus laborers have flocked to cities to look for jobs, ballooning the country's urban population and changing the way China's labor force is defined. Compared with their parents, an increasing percentage of young migrant workers, including Li, prefer to work in the service sector, as it requires less physical labor than the farming and construction industries traditionally favored by migrants, according to a 2010 survey conducted by the Shenzhen Federation of Trade Unions. In addition, more rural people, freed from the prospect of having to work on farms or in factories, are pursuing their dreams by going to school. "Most of our team members came from the countryside before going to university," said Du Wenjing, a 36-year-old researcher at the Institute of Thermal Science and Technology at Shandong University. Du's team designed a heat radiator that serves as a crucial component for the Alpha Magnetic Spectrometer (AMS-02), which was carried into space by the U.S. space shuttle Endeavour on May 16, 2011 to detect cosmic rays. Although Li's parents remain in their hometown in Shandong, working as farmers, Li himself has big plans for the future. "I'd like to continue being a volunteer while working a regular job. I like dancing, but I also want to learn how to sing and play the guitar. I always feel like there's not enough time," he said. "Moving from the countryside to urban areas, migrant workers are the links and bridges between the two world, and are a driving force for China's social progress," reads an introductory message at the Art and Cultural Museum of Migrant Workers at the Migrant Workers' Home in Picun. Official data indicates that China's migrant worker population totaled 263 million by the end of 2012.